any parent or teacher who wishes to provide focused assistance to their child or student. any student who already knows how to write an essay but wants to learn and apply better style and structure to their stories. any student who wants a quick, integrated point of review. illustrates, using actual students' scripts, the various techniques introduced in Quick Cues. provides a better imprint of how a student can incorporate the techniques on structure and style into their narrative compositions. 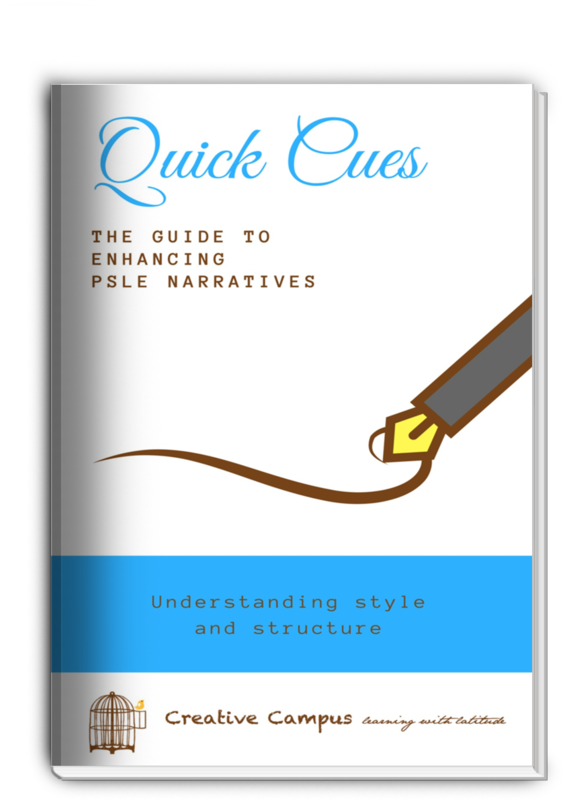 Quick Cues is an ebook which aims to consolidate, in quick bite-sized chapters, each essential skill and technique to narrative writing. Students can pick up the building blocks needed to construct their stories to meet their primary school assessment needs. Feel empowered with cue-cards type prompts, not overwhelmed by lengthy and cumbersome textbooks. No child is the same: develop a personal narrative voice, enjoy writing and do well is exams too! It's a wonderful publication. It comes across more as a textbook or reference guide, which is very useful. The additional "summary cards" at the back of the book means that the reader can get away with something even "quicker"! 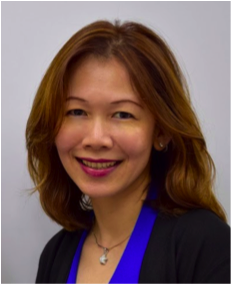 Mrs Jane Wong, a lawyer by training, now a full-time mother of 4. Her eldest took the PSLE in 2016 and scored an A*. Her second is currently in P6. No more struggling with narrative composition writing. Get the fundamentals to improving structure and style in an unintimidating manner. Portable concise chapters in a flip-through e-format. Understand and use the styles or techniques that best suit the individual student. Why is This Book in an E-Format? Students can upload Quick Cues into their electronic devices. 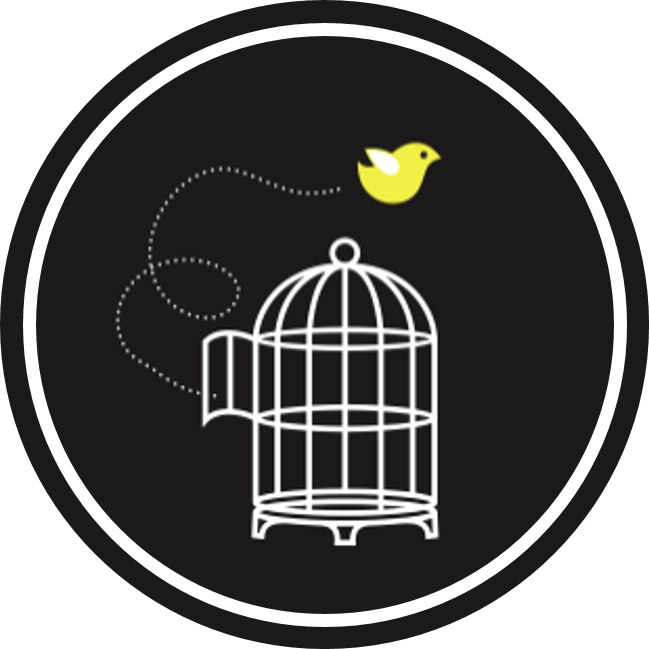 This means that students can constantly refer to, revise for and improve in their writing while ‘on-the-move’. The electronic format is a particularly logical one for Quick Cues since the premise of our book is to provide a cue-cards type handbook for quick reviews. The education industry uses way too much paper as it is. We need to do our part for the planet, and believe that every bit counts. Creative Campus embodies ​the directors' shared vision of the ideal learning environment​--intimate, student-focussed, enriching and enlivened​. It is an ideal that has been honed over almost 20 years of collaboration. "At Creative Campus, lessons and skills are never 'force fed'; rather, we personalise our time, attention and feedback to work with each child as a distinct individual, improving on the weaker areas while honing strengths--this not only develops your child's English potential, but also builds his self-esteem. 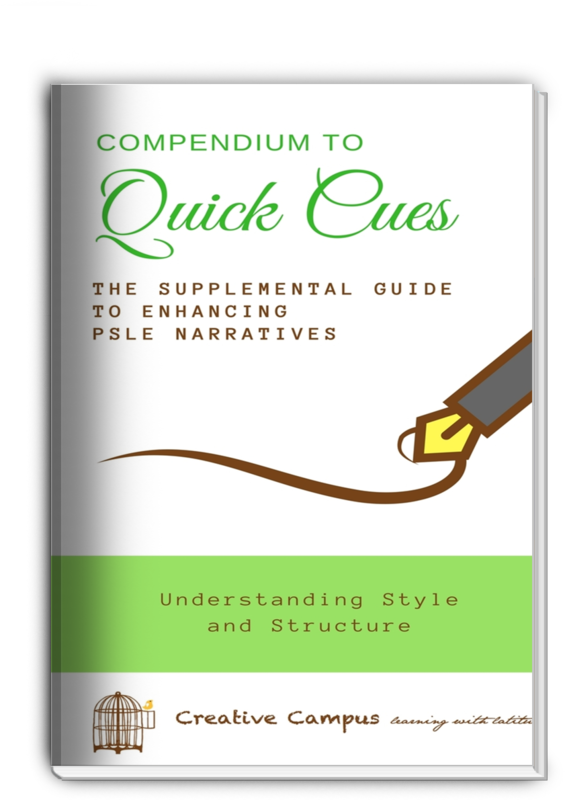 Quick Cues is an e-offering of tips and prompts to better narrative writing. It compiles some of the key writing essentials identified by the directors through their decades of teaching experience and curriculum development. 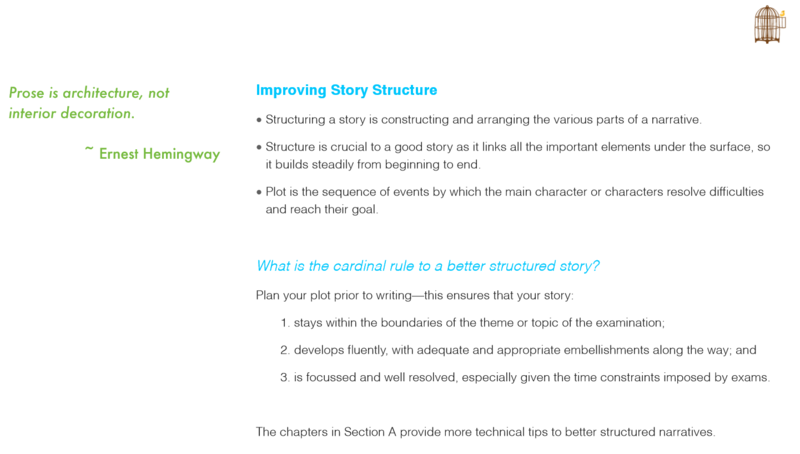 We hope it assists the student storyteller in cultivating a love for and ease to writing narratives. 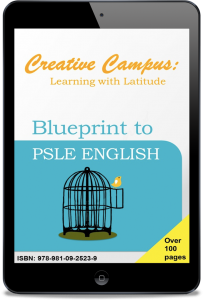 Blueprint to PSLE English, our comprehensive and authoritative guide to help your child get that A* in English at the PSLE. addresses the challenges in the new PSLE Paper 1 format. tips, techniques, and strategies for writing both non-narrative and narrative compositions. FREE Bonus Blueprint to PSLE English on the key aspects of English Main Paper and Orals. For a comprehensive and structured approach to writing first-class essays, we recommend first, the Blueprint, followed by Quick Cues.